A not uncommon complaint of patients presenting to an ENT is a decreased or even loss of smell and taste. Most commonly, this occurs after a viral upper respiratory infection and is transient in nature. However, this complaint may often persist leading a patient to seek help. An ENT will often evaluate for any physical abnormality that may lead to smell/taste loss including presence of an intranasal mass (ie, nasal polyps), facial trauma, sinus infection, vitamin/metal deficiencies, etc. However, assuming the patient is otherwise a normal, healthy individual, a relatively recent paper suggests such sensory depreciation is directly correlated with decreased secretion of growth factors in the saliva and nasal mucus. These growth factors apparently act on stem cells in taste buds and olfactory cells to generate the appropriate apparatus for a fully functional taste and smell sense. 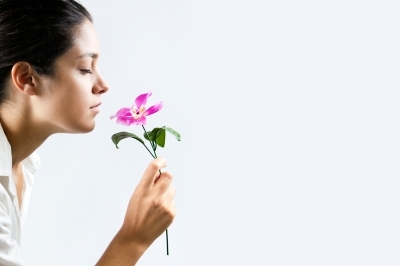 The key growth factors diminished in patients with smell and taste loss are cAMP (cyclic adenosine monophosphate) and cGMP (cyclic guanosine monophosphate). As such, a way to restore normal smell and taste would be to increase cAMP and cGMP via a phosphodiesterase inhibitor drug like theophylline. Researchers have determined that oral theophylline was able to help 50% of patients. Unfortunately, the side effects of the drug proved trying for patients especially given it takes 2-12 months for improvement to occur. Such adverse effects included restlessness, GI discomfort, and cardiac palpitations. Also, oral treatment required regular blood draws to prevent toxic accumulation. As such, intra-nasal theophylline was tried in order to resolve these issues and found to be of superior efficacy (80% of patients reported improvement) and faster onset of improvement (1-4 weeks). Best of all, side effects were negligible. However, the intra-nasal study was performed on only 10 patients and as such, was considered only a pilot study, albeit promising. But something to consider… while larger studies are pursued with control groups to eliminate placebo effect. But, for those curious, the nasal spray version of theophylline requires daily administration 0.4ml of saline containing 20 ug of theophylline methylpropyl paraben. The spray should be directed superiorly into the nose where the olfactory nerve is located. A local compounding pharmacy should be able to make it up for patients. However, it can also be ordered from FoundCare. Intranasal Theophylline Treatmentof Hyposmia and Hypogeusia. Arch Otolaryngol Head Neck Surg. 2012; 138(11):1064-1070.
cAMP and cGMP in nasal mucus related to severity of smell loss in oatients with smell dysfunction. Clin Invest Med. 2008; 31(2):E78-E84. Etiological relationships of parotid saliva cyclic nucleotides in patients with smell and taste dysfunction. Arch Oral Bio 2012; 57 (6):670-677. Aetiological relationships of nasal mucus cyclic nucleotides in patients with smell and taste dysfunction. J Clin Path. 2012; 65(5): 447-451. An open-label controlled trial of theophylline for treatment of patients with hyposmia. Am J Med Sci. 2009; 337(6):396-406.